Polarization (or angle of vibration), which is only weakly perceptible by humans under ordinary circumstances. Due to the wave-particle duality of matter, light simultaneously exhibits properties of both waves and particles. The precise nature of light is one of the key questions of modern physics. The visible spectrum is the portion of the electromagnetic spectrum that is visible to the human eye, referred to as the Balmer series. Electromagnetic radiation in this range of wavelengths is called visible light or simply light. There are no exact bounds to the visible spectrum; a typical human eye will respond to wavelengths from 400 to 700 nm, although some people may be able to perceive wavelengths from 380 to 780 nm. A light-adapted eye typically has its maximum sensitivity at around 555 nm, in the green region of the optical spectrum (see: luminosity function). The spectrum does not, however, contain all the colours that the human eyes and brain can distinguish. Brown and pink are absent, for example. See Colour to understand why. The optical spectrum includes not only visible light, but also infrared and ultraviolet. The speed of light in a vacuum is exactly 299,792,458 metres per second (fixed by definition). Although some people speak of the "velocity of light", the word velocity is usually reserved for vector quantities, which have a direction. The speed of light has been measured many times, by many physicists. The best early measurement in Europe is by Ole Rømer, a Danish physicist, in 1676. By observing the motions of Jupiter and one of its moons, Io, with a telescope, and noting discrepancies in the apparent period of Io's orbit, Rømer calculated that light takes about 18 minutes to traverse the diameter of Earth's orbit. If he had known the diameter of the orbit in kilometres (which he didn't) he would have deduced a speed of 227,000 kilometres per second (approximately 141,050 miles per second). The first successful measurement of the speed of light in Europe using an earthbound apparatus was carried out by Hippolyte Fizeau in 1849. Fizeau directed a beam of light at a mirror several thousand metres away, and placed a rotating cog wheel in the path of the beam from the source to the mirror and back again. At a certain rate of rotation, the beam could pass through one gap in the wheel on the way out and the next gap on the way back. Knowing the distance to the mirror, the number of teeth on the wheel, and the rate of rotation, Fizeau measured the speed of light as 313,000 kilometres per second. Thus, n = 1 in a vacuum and n > 1 in matter. When a beam of light enters a medium from vacuum or another medium, it keeps the same frequency and changes its wavelength. If the incident beam is not orthogonal to the edge between the media, the direction of the beam will change. Refraction of light by lenses is used to focus light in magnifying glasses, spectacles and contact lenses, microscopes and refracting telescopes. The different wavelengths are detected by the human eye and then interpreted by the brain as colours, ranging from red at the longest wavelengths of about 700 nm to violet at the shortest wavelengths of about 400 nm. The intervening frequencies are seen as orange, yellow, green, and blue. The wavelengths of the electromagnetic spectrum immediately outside the range that the human eye is able to perceive are called ultraviolet (UV) at the short wavelength (high frequency) end and infrared (IR) at the long wavelength (low frequency) end. Some animals, such as bees, can see UV radiation while others, such as pit viper snakes, can see infrared light. UV radiation is not normally directly perceived by humans except in a very delayed fashion, as overexposure of the skin to UV light can cause sunburn, or skin cancer, and underexposure can cause vitamin D deficiency. However, because UV is a higher frequency radiation than visible light, it very easily can cause materials to fluoresce visible light. Cameras that can detect IR and convert it to light are called, depending on their application, night-vision cameras or infrared cameras. These are different from image intensifier cameras, which only amplify available visible light. When intense radiation (of any frequency) is absorbed in the skin, it causes heating that can be felt. Since hot objects are strong sources of infrared radiation, IR radiation is commonly associated with this sensation. Any intense radiation that can be absorbed in the skin will have the same effect, however. The following quantities and units are used to measure the quantity or " brightness" of light. Radiance L watt per steradian per square metre W·sr−1·m−2 power per unit solid angle per unit projected source area. Irradiance E watt per square metre W·m−2 power incident on a surface. Sometimes confusingly called " intensity". Radiant exitance / Radiant emittance M watt per square metre W·m−2 power emitted from a surface. polarization (or angle of vibration). In ancient India, the philosophical schools of Samkhya and Vaisheshika, from around the 6th– 5th century BC, developed theories on light. According to the Samkhya school, light is one of the five fundamental "subtle" elements (tanmatra) out of which emerge the gross elements. The atomicity of these elements is not specifically mentioned and it appears that they were actually taken to be continuous. On the other hand, the Vaisheshika school gives an atomic theory of the physical world on the non-atomic ground of ether, space and time. (See Indian atomism.) The basic atoms are those of earth (prthivı), water (apas), fire (tejas), and air (vayu), that should not be confused with the ordinary meaning of these terms. These atoms are taken to form binary molecules that combine further to form larger molecules. Motion is defined in terms of the movement of the physical atoms and it appears that it is taken to be non-instantaneous. Light rays are taken to be a stream of high velocity of tejas (fire) atoms. The particles of light can exhibit different characteristics depending on the speed and the arrangements of the tejas atoms. Around the first century, the Vishnu Purana refers to sunlight as the "the seven rays of the sun". Later in 499, Aryabhata, who proposed a heliocentric solar system of gravitation in his Aryabhatiya, wrote that the planets and the Moon do not have their own light but reflect the light of the Sun. The Indian Buddhists, such as Dignāga in the 5th century and Dharmakirti in the 7th century, developed a type of atomism that is a philosophy about reality being composed of atomic entities that are momentary flashes of light or energy. They viewed light as being an atomic entity equivalent to energy, similar to the modern concept of photons, though they also viewed all matter as being composed of these light/energy particles. In about 300 BC, Euclid wrote Optica, in which he studied the properties of light. Euclid postulated that light travelled in straight lines and he described the laws of reflection and studied them mathematically. He questioned that sight is the result of a beam from the eye, for he asks how one sees the stars immediately, if one closes ones eyes, then opens them at night. Of course if the beam from the eye travels infinitely fast this is not a problem. Despite being remarkably similar to how we think of light today, Lucretius's views were not generally accepted and light was still theorized as emanating from the eye. Ptolemy (c. 2nd century) wrote about the refraction of light, and developed a theory of vision that objects are seen by rays of light emanating from the eyes. The Muslim scientist Abu Ali al-Hasan ibn al-Haytham (c. 965- 1040), also known as Alhazen in the West, developed a broad theory that explained vision, using geometry and anatomy, which stated that each point on an illuminated area or object radiates light rays in every direction, but that only one ray from each point, which strikes the eye perpendicularly, can be seen. The other rays strike at different angles and are not seen. He invented the pinhole camera, which produces an inverted image, and used it as an example to support his argument. This contradicted Ptolemy's theory of vision that objects are seen by rays of light emanating from the eyes. Alhazen held light rays to be streams of minute particles that travelled at a finite speed. He improved Ptolemy's theory of the refraction of light, and went on to discover the laws of refraction. He also carried out the first experiments on the dispersion of light into its constituent colours. His major work Kitab al-Manazir was translated into Latin in the Middle Ages, as well his book dealing with the colours of sunset. He dealt at length with the theory of various physical phenomena like shadows, eclipses, the rainbow. He also attempted to explain binocular vision, and gave a correct explanation of the apparent increase in size of the sun and the moon when near the horizon. Through these extensive researches on optics, Al-Haytham is considered the father of modern optics. Al-Haytham also correctly argued that we see objects because the sun's rays of light, which he believed to be streams of tiny particles travelling in straight lines, are reflected from objects into our eyes. He understood that light must travel at a large but finite velocity, and that refraction is caused by the velocity being different in different substances. He also studied spherical and parabolic mirrors, and understood how refraction by a lens will allow images to be focused and magnification to take place. He understood mathematically why a spherical mirror produces aberration. René Descartes (1596-1650) held that light was a disturbance of the plenum, the continuous substance of which the universe was composed. In 1637 he published a theory of the refraction of light that assumed, incorrectly, that light travelled faster in a denser medium than in a less dense medium. Descartes arrived at this conclusion by analogy with the behaviour of sound waves. Although Descarte's was incorrect about the relative speeds, he was on the right track in terms of assuming that light behaved like a wave and in concluding that refraction could be explained by the speed of light in different media. As a result, Descartes' theory is often regarded as the forerunner of the wave theory of light. Pierre Gassendi (1592-1655), an atomist, proposed a particle theory of light which was published posthumously in the 1660s. Isaac Newton studied Gassendi's work at an early age, and preferred his view to Descartes' theory of the plenum. He stated in his Hypothesis of Light of 1675 that light was composed of corpuscles (particles of matter) which were emitted in all directions from a source. One of Newton's arguments against the wave nature of light was that waves were known to bend around obstacles, while light travelled only in straight lines. He did, however, explain the phenomenon of the diffraction of light (which had been observed by Francesco Grimaldi) by allowing that a light particle could create a localised wave in the aether. In the 1660s, Robert Hooke published a wave theory of light. Christian Huygens worked out his own wave theory of light in 1678, and published it in his Treatise on light in 1690. He proposed that light was emitted in all directions as a series of waves in a medium called the Luminiferous aether. As waves are not affected by gravity, it was assumed that they slowed down upon entering a denser medium. 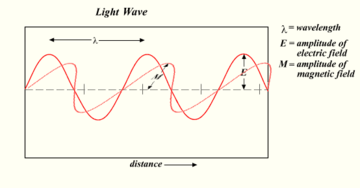 The wave theory predicted that light waves could interfere with each other like sound waves (as noted in the 18th century by Thomas Young), and that light could be polarized. Young showed by means of a diffraction experiment that light behaved as waves. He also proposed that different colours were caused by different wavelengths of light, and explained colour vision in terms of three-coloured receptors in the eye. Another supporter of the wave theory was Leonhard Euler. He argued in Nova theoria lucis et colorum ( 1746) that diffraction could more easily be explained by a wave theory. Later, Augustin-Jean Fresnel independently worked out his own wave theory of light, and presented it to the Académie des Sciences in 1817. Simeon Denis Poisson added to Fresnel's mathematical work to produce a convincing argument in favour of the wave theory, helping to overturn Newton's corpuscular theory. Another experimental anomaly was the photoelectric effect, by which light striking a metal surface ejected electrons from the surface, causing an electric current to flow across an applied voltage. Experimental measurements demonstrated that the energy of individual ejected electrons was proportional to the frequency, rather than the intensity, of the light. Furthermore, below a certain minimum frequency, which depended on the particular metal, no current would flow regardless of the intensity. These observations clearly contradicted the wave theory, and for years physicists tried in vain to find an explanation. In 1905, Einstein solved this puzzle as well, this time by resurrecting the particle theory of light to explain the observed effect. Because of the preponderance of evidence in favour of the wave theory, however, Einstein's ideas were met initially by great skepticism among established physicists. But eventually Einstein's explanation of the photoelectric effect would triumph, and it ultimately formed the basis for wave-particle duality and much of quantum mechanics. The modern theory that explains the nature of light is wave-particle duality, described by Albert Einstein in the early 1900s, based on his work on the photoelectric effect and Planck's results. Einstein determined that the energy of a photon is proportional to its frequency. More generally, the theory states that everything has both a particle nature and a wave nature, and various experiments can be done to bring out one or the other. The particle nature is more easily discerned if an object has a large mass, so it took until an experiment by Louis de Broglie in 1924 to realise that electrons also exhibited wave-particle duality. Einstein received the Nobel Prize in 1921 for his work with the wave-particle duality on photons, and de Broglie followed in 1929 for his extension to other particles. The quantum mechanical theory of light and electromagnetic radiation continued to evolve through the 1920's and 1930's, and culminated with the development during the 1940's of the theory of quantum electrodynamics, or QED. This so-called quantum field theory is among the most comprehensive and experimentally successful theories ever formulated to explain a set of natural phenomena. QED was developed primarily by physicists Richard Feynman, Freeman Dyson, Julian Schwinger, and Sin-Itiro Tomonaga. Feynman, Schwinger, and Tomonaga shared the 1965 Nobel Prize in Physics for their contributions.